Wonderful lakefront fully furnished home with sunny deck, 5 bedrooms and 2.5 bathrooms, beautiful sunsets, and your own private boat dock. Enjoying dining on your deck while you watch the kids fish and swim off the dock. The lakehouse is situated on Deer Island, facing the cove, where the lake is most tranquil. Ideal for families with children as there are 5 bedrooms: 2 bedrooms with queen size bed and 3 bedrooms with a twin-sized trundle bed in each room. Easily accommodates 10. The home is also idea for social gatherings or get-togethers of friends and family. In addition to the fun of direct waterfront activities, there is also cable tv, golf, fine dining, quaint village antiquing and shopping in Litchfield. Only 120 minutes to NYC, 20 minutes to wineries and beautiful Connecticut sightseeing. In addition, White Memorial Woods on Bantam Lake (5 minutes away) is a beautiful spot. I personally have cooked meals for 12-15 with no trouble in the fully-outfitted (if not totally state-of-the-art) kitchen. And we've enjoyed countless BBQs and sunsets off the deck. This place has been truly heaven for me and my family. Perhaps you'd like to create some special memories here as well. Here you will enjoy dining on your deck while you watch the kids fish and swim off the dock. The lakehouse is situated on Deer Island, facing the cove, where the lake is most tranquil. The house is only 2 hours from NYC, 20 minutes to wineries and beautiful Connecticut sightseeing. In addition, White Memorial Woods on the lake (5 minutes away by car or boat) is a beautiful spot for hiking, canoeing, and kayaking, and Sandy Beach and Morris Town Beach offer a fun place for beach swimming (especially great for children). All rentals begin on SATURDAY and end on FRIDAYS. In other words, a 1-week rental is 6-nights and 7-days, starting on a Saturday, and ending on a Friday. My husband and I live in New York City, with our two girls. I am the director of a non-profit school for children with disabilities, while my husband is in finance. We are down-to-earth, water-loving, lake-adoring people who enjoy gatherings with good food and great friends. We love to entertain, cook big meals, and share our space with others. My husband is also a professional blues guitarist (though he keeps his day job to pay the bills) who regularly plays in the Village. My husband and I rented this cottage for two years with our two children. It didn't take long for us to get hooked! Not only is the house great, but the lake is beautiful, and the community is the best. We loved the whole experience so much, we bought it and the house next door. We now stay in the house next door on weekends and during much of the summer. We rent out this cottage during most weeks of the summer, and keep it for family visits during a few weeks. Someday we will move to the lake full-time. We love the low-key lake life. We awake to a fresh cup of tea on the deck, a walk down to the dock, and usually by 9 AM, we've taken our first boat ride and said hello to some of our fellow lake friends. If you have your own boat and like water skiing, you will love Bantam Lake where you'll find some of the country's best skiers. There's a water ski course, which the serious skiers (including my husband) visit in the wee hours of the morning. Our cottage is located on a cove, where the water is most calm and quiet. But in general, the water and the lake is both calm and quiet (especially compared to other lakes that allow motor boats). Even on holiday weekends, the lake is peaceful, but FUN! I hosted my mom's 90th birthday at this house. There were 25 people and it had ample seating for everyone between inside the house and the table on the deck. Loved the personal touches of the flowers in the vase, the toiletries and bathrobes in each of the bedrooms, the coffee cake, chocolates, and bread. There were ample platters and bowls for serving all the food. My only negative comment was housekeepers needed to up their game a little bit more. But we would love to rent again when we could take advantage of the lake activities. Thank you for your thoughtful review. And for letting me know that housekeeping wasn't all that you expected. We will take special care to ensure this is improved. I'm so glad your mother had a nice birthday celebration. We would be delighted to have you visit us a again. Had a great time in Connecticut cozy cabin was perfect for the family everyone had a good time. Would love to get back there some day had great time. Cabin was classic vintage quiet with great view off deck. Thanks Coco for making it so comfortable. Thank you for taking the time to review our cottage on Bantam Lake! I'm delighted to hear you enjoyed your stay. I hope to host you again soon. Travel safe and well. We had a wonderful vacation at this lake side cottage. The views over the lake were amazing and the accommodation was very comfortable. We really enjoyed spending the day on the water using the kayaks / paddleboards and our own jet skis and the evenings grilling on the deck. The owners were very accommodating and I would highly recommend staying at this cottage. My family and I stayed here last weekend (mid June) and had the best vacation I think we have ever taken. We walked into a very clean cottage with a few special touches from the owner that made us say "wow." They were very thoughtful. It's a beautiful spot on the lake, on a calm cove and my kids loved fishing and swimming off the dock. We brought our kayaks and canoe and rented a paddle board. We enjoyed the peaceful atmosphere on Bantam Lake and the cottage. About 15 min from Stop and Shop and a local market. We didn't do any hiking or sightseeing but thoroughly enjoyed just resting and spending time with family. The house had everything we needed. It was wonderful! We will definitely consider this location again. Lovely lakeside home, lovingly maintained. Terrific house with a surprising amount of space. We were in Litchfield celebrating our son's wedding and needed a house large enough for our entire family. Coco is wonderful - so thoughtful. once again the Irish have landed (legally). This time deciding to stay in a lake-house and what a choice. Our first impressions were more than what we expected. The area is truly beautiful with amazing lake views. As we parked our car, and unloaded all the suitcases (I was traveling with three women, and seeing as we were coming for a wedding, you could only imagine all the extra extra items..) we noticed how welcoming the area felt and how well situated our house was to the lake. upon entering the house, we were met with a very clean spacious, living and dining area with a nice view to the lake. 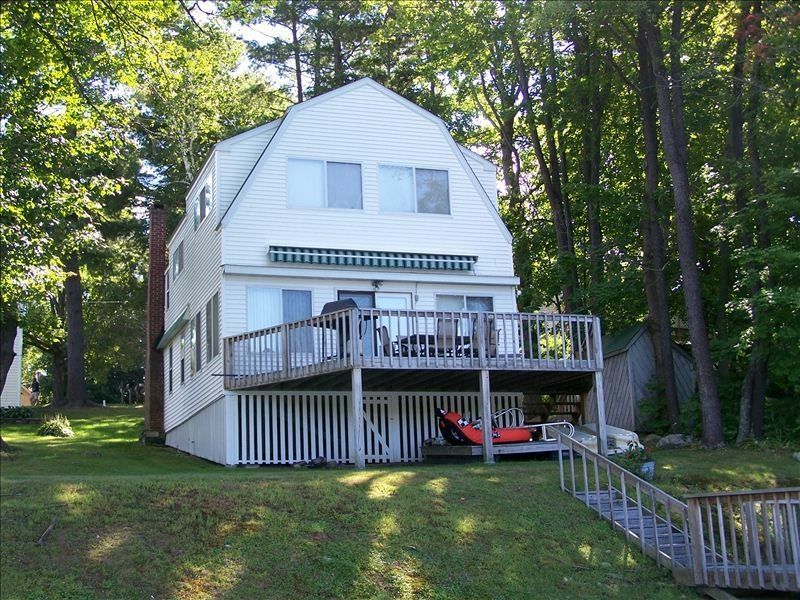 Although the house is old it is very well kept and very in much keeps in line with the cliche of a lake home. The bedrooms consist or two large and three small, the large ones having air conditioning, and providing ample space for unloading all those suitcases. It is remarkable how quickly this felt like home to everyone with all the little extras and items that you wouldn't normally find in a rental property. A few days into our stay the Australians arrived adding four more people to the house and constant other family members who were also staying in the area coming and going. You would think this would be tight but the house is so spacious with plenty of seating between, living room, dining room and decking it never felt like so many people were there. Although the kitchen is small it is very functional to the point we were able to make a four tier wedding cake there (be it using some specific utensils from the cases). The local area is quite small but very friendly, we would highly recommend going to Jackies (5min away drive) for breakfast, or lunch (friendly staff, very reasonably priced and good food). There are other amenities supermarket, bar, liquor store, bantam pizza etc. larger and more amenities just 20min drive away. We would highly recommend this property and will definitely choose it again on our return to bantam.